If you thought squatching across the Pacific Northwest looking for Bigfoot was a tough mission and possibly pointless excursion, then imagine doing this atop the brutal Himalayan mountains looking for it's way more terrifying and equally massive snowy cousin, the Yeti AKA The Abominable Snowman. Well, now you can save your time and your life by simply spending $15,000 for this cool new Full-Sized Abominable Snowman / Yeti Statue instead. 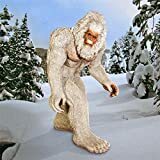 Crafted from an inner steel armature that is surrounded by foam and covered in real dyed yak fur with punched hair on the face, this monstrously realistic Yeti statue stands a whopping 9 feet tall upon a snow-covered base with a pile of skulls. It's even holding a bloody limb in one hand to drive home the terror. Sure, it's not the real thing, but when you tell everyone the incredible tale of how you hunted this snow monster down, battled it to the death, and had its gigantic corpse flown back, stuffed, and mounted as proof of its existence... well, maybe someone will buy your tall tale. Opinions do not matter though, because this humongous creature is now standing tall in your living room, bedroom, or just looking out the front window terrifying the entire neighborhood! It also makes a quite festive Christmas decoration!